Wow wow wow.. I’m impressed! Vanity Trove takes feedback seriously! And efficiently! Had dropped Victoria an email on Sunday night with regards to the Sunbrella leaking issue and I got my replacement the next day! Tho the time of delivery was a bit off but still glad to be able to get my replacement within such short period..! 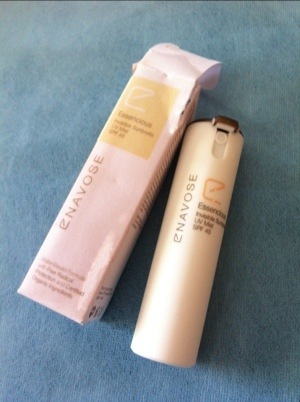 Allowing me to try my new VT product within the same week!! I’m a happy girl agn!! I tried spraying some on my hand.. It feels a bit sticky but not oily.. Does not have any weird smell too.. About 5mins later the sticky feeling is gone..
Well.. Unknowingly I alr had 3 products from Enavose.. 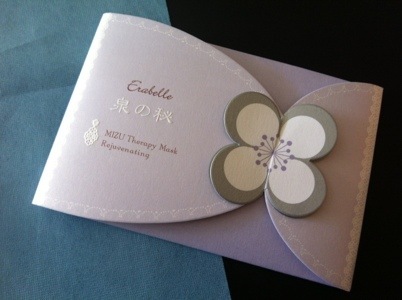 The first two (mask & youth guard) are from Bellabox and the UV Mist is from Vanity Trove.. 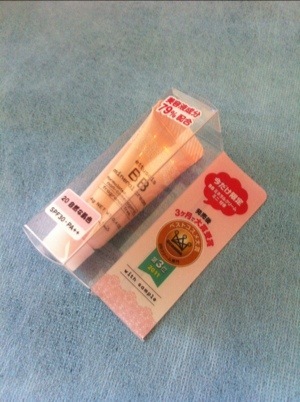 Frankly speaking I loveee the black tea mask!!! 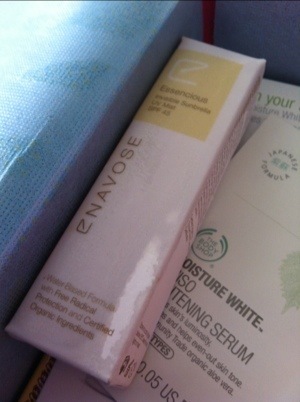 It’s super hydrating and u can almost immediately feel the difference after u wash off ur mask…! I think I’m gona grab a regular size home..! Now the next thing I wana share w u is this SKINC Jelly..! Hahaha.. It taste really not bad! 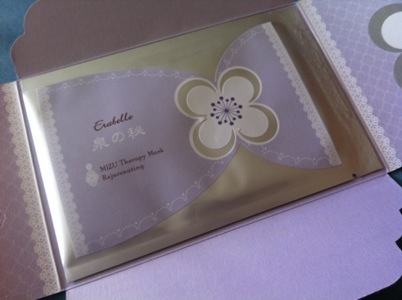 First time u can enjoy ur supplement like hvg dessert!! The retail price for this is about $58 for 14 sachets.. And 14 days later u will see the difference… But oh well I think I’ll have my two sachets as dessert thn!! Yummy!!! Last night I blogged about not rec’g my June Trove and today.. I’m gona share my disappointment about June Trove..
Jus rec’d my Trove tdy, it’s not the same courier guy as the last two times. This guy’s not bad but the previous one’s better..
What have I got this month?? Plenty!! Plenty of disappointment.. I thot the protective safety cap is suppose to protect it but it seems like it’s either the cap is not doing a good job or VT did not check the bot bef sending.. 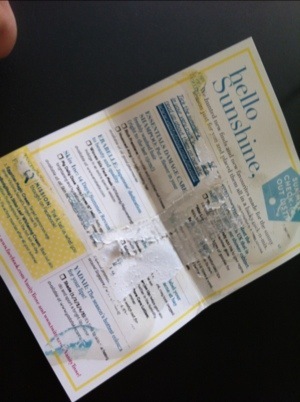 I tried to spray some on my hand to see how it looks like and apparently… NOTHING came out.. Utterly disappointed! The bottle has nth left!! 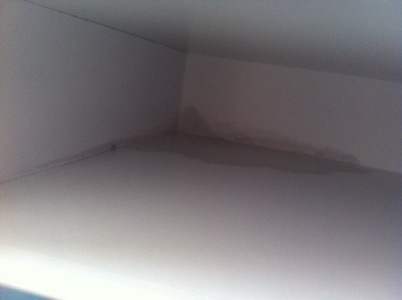 The mist is all over the box but not in the bottle! It’s spilled everywhr! The box is sticky and messy.. And I think it has been spilled quite some time alr as the lil card VT would usually attached tog is almost like ‘glued’ tog..! I kinda like this month’s card but……. See what I mean?? 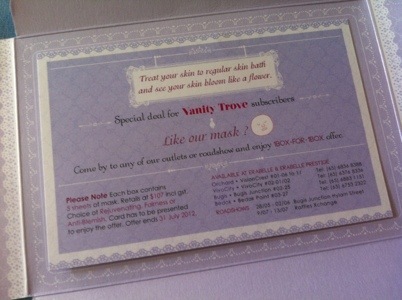 Probably I should reconsider if I want to continue my subscription w Vanity Trove.. Anyway.. Some other items in the box includes…. Essential Damage Care shampoo.. 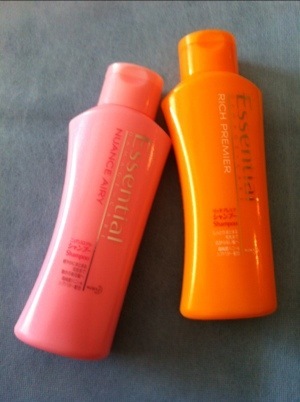 Both rich premier & nuance airy are in travel size (80ml).. I’ve used both before.. Smells good but it feels like seeing Pantene in my Trove box.. Nothing special..
Update on June 3: this is good stuff!! 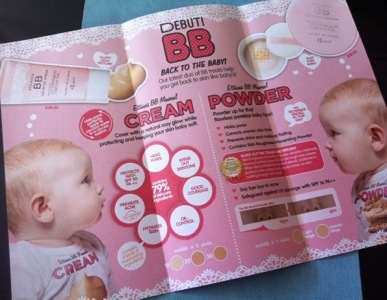 It can really even out skin tone and hide pore! 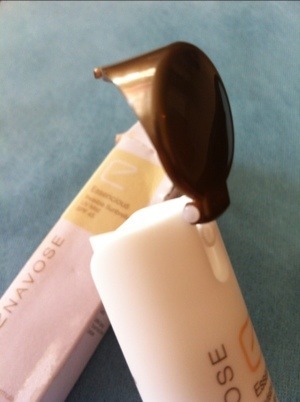 The SPF I can’t feel it so can’t really say it work or did not work! Hahaha! 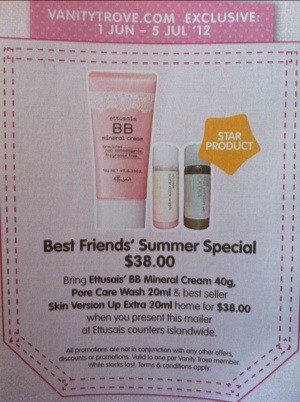 But I’m really loving this product! 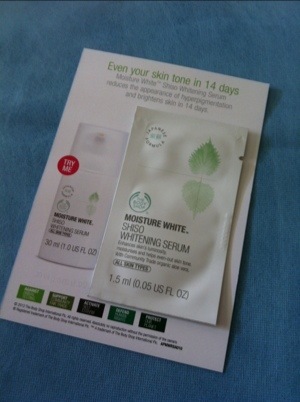 Will be purchasing the full size at Ettusais counter using VT promo leaflet..
Jelly (13gms)?? Haha! Interesting.. (but still can’t get over my spilled sunbrella!!) haven’t seen anything like this before. This jelly is by SKINC. Wat it can do? I suppose that will be anti-aging, brightening and detox.. I wonder if they have other type of jelly? Lolx! 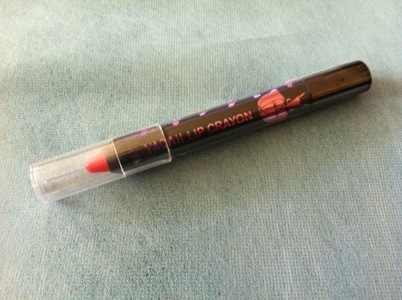 Let me try one soon before I comment further abt the taste etc..
Yadah lip crayon pencil.. 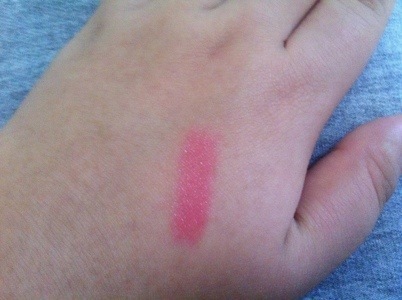 The color I got is 02 lovely pink.. Well.. Sure enuff it’s lovely.. Ingredient? Extract from several kinds of vegetables oil. That’s all for my regular June Trove.. Next, I’ll be showing you my Testing Task Force products that comes together with my June Trove..
Update on June 3: this is a not bad product.. At least I feel this way. 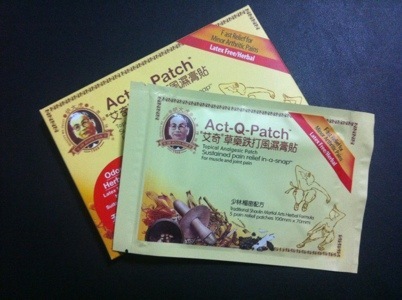 1 packet is only good for 2-3 usage.. I’ve got a bigger face area so only 2 use. 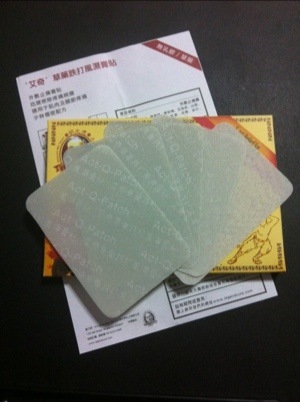 But I’m quite satisfied w e effect aft my 2 use. 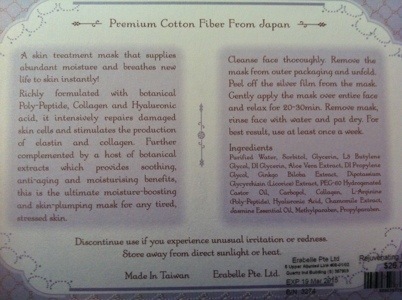 Tho I can’t see significant whitened effect on my face but it wasn’t too oily and din cause any outbreak! 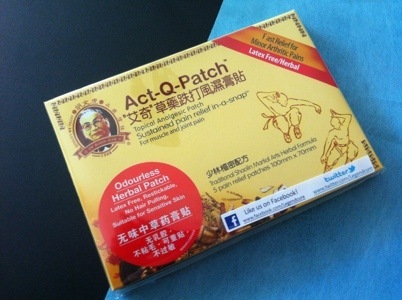 Previously the Egyptian Magic Cream I rec’d is also part of this Teating Task Force..